The case began in July 2013 when the National Labor Relations Board (NLRB) filed a petition for injunctive relief to enforce an administrative law ruling by Judge Arthur Amchan that Affinity Medical Center, an affiliate of the nation’s largest hospital chain, Tennessee-based Community Health Systems, violated labor law by refusing to recognize or bargain with the union after it won an August 2012 representation election and by firing long-time registered nurse and union supporter Ann Wayt on “pretextual grounds” in retaliation for her union organizing activity. This was meant to send a message to all the nurses at the hospital that supported the union, that if you continue to support this union that the hospital will not recognize, you will risk the one thing that allows you to practice as a nurse: your license. its report to the Ohio Board of Nursing and expunge any reference to the disciplinary action against her from her personnel file, nurses at Affinity Medical Center celebrated and praised the ruling. “Finally, a step in the right direction, justice for Ann and an opportunity to start contract talks. The federal law has spoken,” said Tamara Wiseman, a Medical Surgical/Telemetry RN. “I will be so happy to have Ann back at the hospital. She is so respected at the hospital as a fabulous nurse and role model for so many at Affinity,” said mental health RN Michelle Canfora. “CHS may think they are above the law, but this order sends a clear message. We look forward to having our sister Ann back and moving forward to contract negotiations that will improve patient care conditions at Affinity,” said Bob McKinney, Medical Surgical/Telemetry RN. “Thank you Ann for staying strong! You have given us courage. 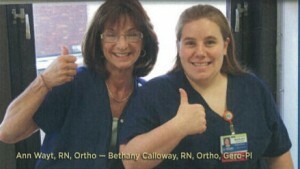 We are so pleased to see justice prevail for Ann and all Affinity RNs,” said Intensive Care Unit RN Sarah Falanga.